Embroidery is hot hot hot these days and you can spot it anywhere from the runways of New York to the clothing aisles of your local Target. 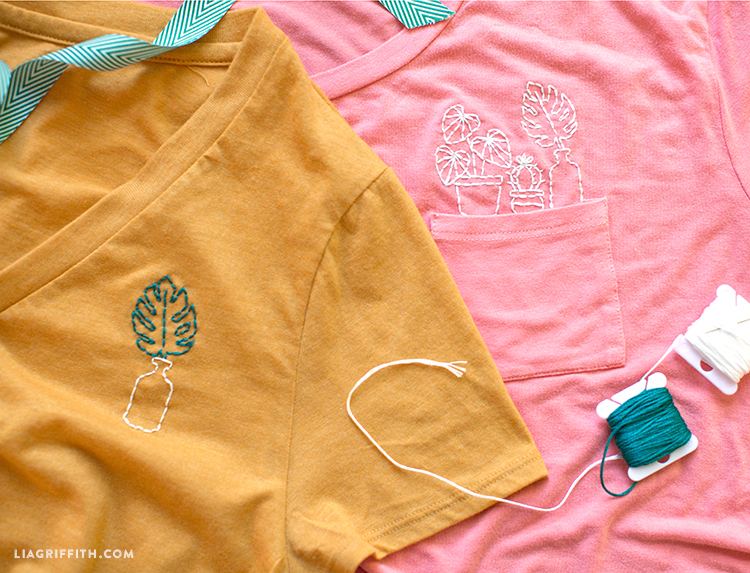 Time to share our own t-shirt embroidery tutorial so you can get in on the trend! Embroidering a special design is a great way to create your own one-of-a-kind fashion statement, or to simply revive an old shirt that has been sitting in the back of your drawer. In this tutorial we will show you how to straight stitch your design, which is the best introduction for beginners to the technique. If you want to do a bit more exploring, find all of our embroidery basics tutorials. Watch our video for this t-shirt embroidery tutorial at the bottom of this post. Feel free to follow along with these written instructions for reference! Cut out the image you want from the template and place it on your shirt. Note that the patterns in the template are mirrored. Trace the image with an iron-on transfer pencil directly onto the printed paper. Trace with firm, even lines, rather than using a sketching motion. Place the image face down in the desired location on your shirt. Make sure to pre-wash your shirt! With a press cloth on top, hold a heated iron (without steam) down for about 10-20 seconds. Temperature and length depends on the fiber content of your shirt. Check to make sure that your image has successfully transferred onto the fabric. Note that once you transfer a design, the markings will be permanent. They may fade over time and with washing. Cut a piece of stabilizer to fit over the entire embroidery hoop. Hoop the stabilizer with the grid side up and tighten. Score the stabilizer along the edge of the hoop with your needle and peel off the paper backing. Lay the shirt with the design on top and press gently onto the stabilizer until it sticks. Smooth out any wrinkles and bumps. Avoid stretching the shirt out too much as it can cause puckering with your finished embroidery. Split your embroidery floss in half (like we did), or use a full strand for a thicker line if desired. Knot the end and begin straight stitching onto your shirt, following the traced design. Make evenly spaced stitches that are not pulled too tight. After you are finished embroidering, gently tear the stabilizer away from the back of the design. 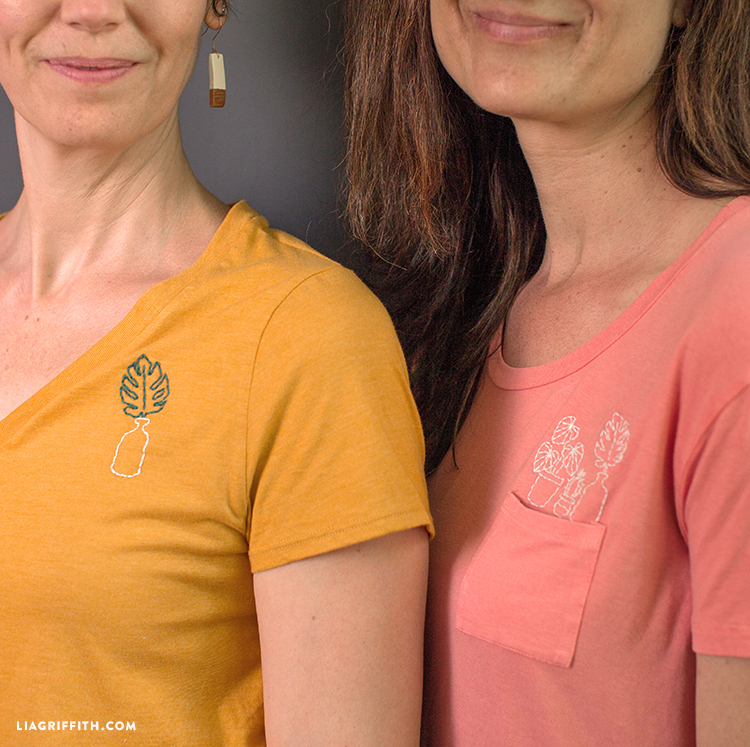 We found our basic shirts at Target, and after embroidering on them we realized that the less spandex in the shirt, the better for stitching. If you can, we recommend starting with a linen or 100% cotton shirt. As we mentioned, you will want to pre-wash your shirt before stitching! Once you get to step 5 in the tutorial, you will add a stabilizer to the fabric, which will stiffen it while you stitch. This is certainly helpful for keeping the stitches straight. Love this! 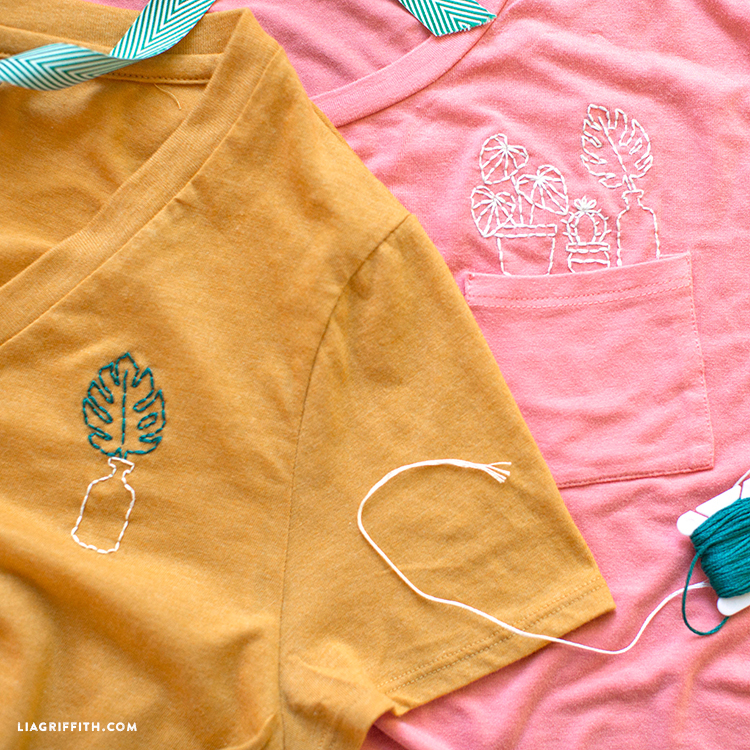 I’ve been eyeing up some embroidered shirts recently, but now I might have to just make my own – I had no idea it would be so simple! your material list mentions “Tear-away-stabilizer” (to be used for weavery). There are 2 special stabilizers for jerseys/ interlock etc., both are softer than the regular stabilizer: one for common T-Shirt knits (Sulky Totally stable) and one especially for Baby clothes (very soft). They have to be ironed on or fixed by pins resp. water soluble adhesives and can later easily be torn off or washed away. Little leftovers are comfortable on your skin, while sometimes regular stabilizers are not comfortable on sensitive or Baby skin. Madeira offers “Cotton soft” (Tear away) and “Cotton Fix” (selfsticking, Tear away). OESD offers stabilizers, too and if you have leftovers/ little scrabs of Vilene (no. 180 or 200, stabilizers for sewing) you can alternatively use these. Thank you for the expert advice!! I LOVE this so much! So inspired to make my own design… now to decide! Love that this can probably be completed in the short windows of time I get with two youngsters these days. Exactly! We love this trend even more knowing how simple it can be.